Hartford's New Year's Celebration Graced with Festive Jazz Version of "Peter and the Wolf"
The ensemble remains unbowed and devoutly dedicated to keeping the modern big band sound alive. The New England Jazz Ensemble ushers in the New Year with pianist/arranger Walter Gwardyak's acclaimed jazz band adaptation of Sergei Prokofiev's classic "Peter and the Wolf." The performance takes place at First Night Hartford's downtown festivities on December 31 with two matinee performances at the Wadsworth Atheneum Museum of Art. Comprised of top regional jazz composers, arrangers and instrumentalists, the power-house, 16-piece collective presents Gwardyak's new, artful, museum-worthy interpretation of the work that has been charming children of all ages for decades with performances at 3:00 and 4:00 pm in the downtown museum's historic Aetna Theatre. Formed in 1991 as a rehearsal band and forum for new compositions by its members, the NEJE, with its recordings, concerts, workshops and performances at festivals from Worcester, Mass., to Corinth, Greece, has become an invaluable regional cultural asset. Although relatively unsung and woefully underfunded, the ensemble remains unbowed and devoutly dedicated to keeping the modern big band sound alive, as exemplified by this latest imaginative creation by Gwardyak, the NEJE's music director. A versatile, much sought-after jazz writer, Gwardyak gracefully mixes sophistication and swing with his charts of fine arts status that move and groove with a natural flow. Gwardyak, who served with distinction with the Buddy Rich Band and performed with such jazz greats as Pepper Adams and Zoot Sims, has created a complex, engaging work, translating "Peter and the Wolf" into a modern big band jazz idiom that swings and stands on its own merits as a rich ensemble work. While Gwardyak brings his well-honed jazz sense and sensibility to bear on this new interpretation, Giacomo Gates, the noted bebop vocalist, acrobatic scatmeister and reigning Viceroy of Vocalese, brings his hip verbal skills to bear on the new narration that he has written and will perform. Over the decades of countless performances for stage, screen (most famously the Disney animated version in 1946), television and innumerable recordings, the narrator for "Peter and the Wolf" has been played by a dizzying array of performers, including Mikhail Gorbachev, Captain Kangaroo, Leonard Bernstein, Boris Karloff, Eleanor Roosevelt, Sting, and Jonathan Winters. If you were casting an arranger/composer and a writer/singer to infuse the original classical piece with jazz body and soul, you couldn't find a better, more natural alliance than Gwardyak, a musical maven, and Gates, a vocalist/librettist who knows all about the molecular bending and shaping of sheer sound, syllables, words, phrases and lyrics into new forms that dance across bar lines on top of rhythms and harmonies. Last October, the NEJE, a band for all seasons with a special gift for holiday music, presented its "Peter and the Wolf" concert at West Hartford's Conard High School. More recently, and also in a holiday groove, the NEJE performed its popular Ellington/Strayhorn jazz band adaptation of Tchaikovsky's "The Nutcracker Suite" on December 6 at Infinity Hall in Hartford. Just the year before, the band made its Infinity Hall debut with "The Nutcracker" and was brought back by popular demand for an encore performance at the red-hot downtown venue. NEJE's hybrid of hipness and holiday happiness is also reflected in one of its popular albums, A Cookin' Christmas, which features the Ellingtonian "Nutcracker" and other holiday chestnuts served with fresh jazz sizzle. The Christmas CD is decorated in the fine festive big band manner that has become part of the NEJE's high-quality signature sound. 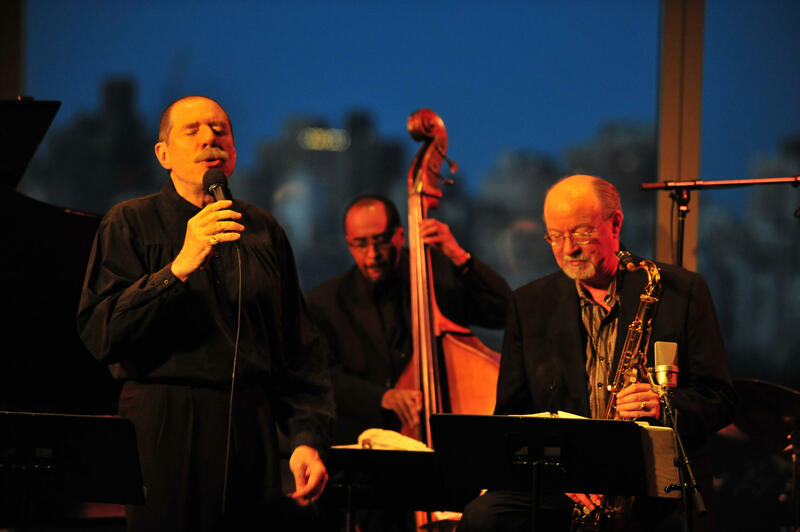 The band has a voice of its own, whether it's digging into jazz standards, or playing from its book of original, contemporary compositions and arrangements written by its members. One of the ensemble's stated goals is to encourage the writing of new works, a practice that rejuvenates the big band tradition, acting as an antidote to relying too heavily on the litany of tried-and-true favorites from the glory days of the Big Band Era. Not that there is anything wrong with Golden Oldies from the 1930s and '40s. But instead of routinely serving, say, yet another round of Glenn Miller Lite, the NEJE features top-shelf concoctions of its own making. Its specialty of the house is its original VSOP champagne utterly free from the sham of commercialism and the aural pain caused by hazardously, cliche-clogged charts. Here's the NEJE's lineup for the doubleheader: trumpets: Don Clough, Steve Fitzko, Adam Mejaour, Hank Zorn; trombones: Ben Griffin, Dan Hendrix, Peter McEachern, Dave Wampler; sax/woodwinds: John Mastroianni, Bobby DePalma, Mike Leventhal, Larry Dvorin, Lisa LaDone; rhythm section: piano Walter Gwardyak, drums/director Jeff Holmes, bass Jeff Dostal; narrator, Giacomo Gates. For more information: NEJE.org. Besides the NEJE's new venture with the Prokofiev piece -- a child-friendly favorite written, ironically enough, during the bloodthirsty Stalinist reign of terror -- First Night Hartford also revels in a mix of merrymaking attractions. These range from fireworks displays and horse-drawn rides to face painting and fortune tellers plying their ancient trade, appropriately enough, on the steps of City Hall. The New Year's Eve urban bash also marches to the beat of diverse musical genres, with multiple events ringing out joyfully throughout the downtown area. 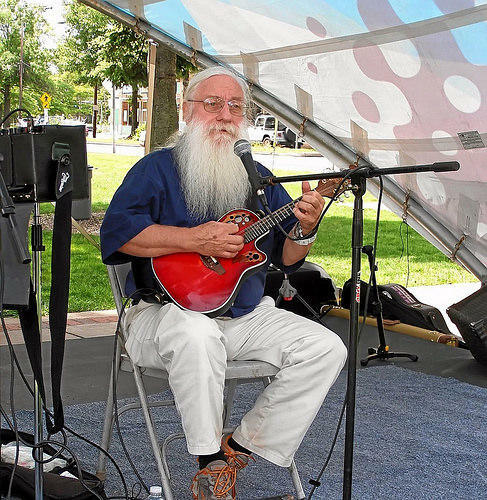 Among the many musicians filling the capital city with the sound of music are two legendary Connecticut troubadours, mandolin maestro Bill Walach and the colorful, banjo playing, folk singing entertainer, Don Sineti. Walach, a venerable veteran of the music scene, wails with great warmth and wizard-like musicianship, showmanship and wit with his encyclopedic, but never academic sounding mastery of Celtic, bluegrass, maritime, Americana songs and virtually anything from funk to jazz. Renowned for his booming voice, Sineti sings rousing sea shanties and whaling ballads while accompanying himself with boisterous banjo picking. A one-man band, Steve Roys joins the celebration on accordion, harmonica and percussion instruments. Walach and Sineti herald the incoming New Year at the Pump House Gallery Courtyard in Bushnell Park near the Ice Rink. For more information on First Night Hartford festivities go to firstnighthartford.org. Please submit press releases on upcoming jazz events at least two weeks before the publication date to omac28@gmail.com. Comments are welcome. If you're looking for the perfect last-minute holiday gift for either a devout jazz fan or even a jazz skeptic, your best bet is the impassioned, madly inventive yet readily accessible The Complete Concert by the Sea, a splendid, Grammy-nominated, three-CD boxed set reissue of Erroll Garner's classic, live 1955 performance that became one of the best-selling jazz albums ever. Inspired by the age-old Delta blues, Noah Preminger and his delta force quartet create a 21st century re-imagining of two soul-drenched songs by legendary blues singer Bukka White on the young tenor saxophonist's dynamic, new album, Pivot: Live at the 55 Bar, a jazz bistro in Greenwich Village. Besides being a swinging guitarist and a cool but emotionally expressive vocalist, John Pizzarelli is also an amusing stand-up humorist who digs connecting with his audience. A venerable poem written 140 years ago by an unconquerably positive and invincibly sentimental Victorian scribe is the inspiration for a hip, 21st-century jazz drummer/composer's new CD, an irrepressibly soulful work that makes its Connecticut debut this weekend.